Harvesting may lead to evolutionary changes in life histories on a contemporary time scale, changes that could be maladaptive in natural contexts. However, our understanding of the strength and direction of harvest-induced selection versus natural selection is still limited, partly due to the difficulty of tracking the fate of individuals in the wild. Here, we present direct estimates of harvest mortality, natural mortality and site fidelity of coastal Atlantic cod (Gadus morhua) from the Norwegian Skagerrak coast. Furthermore, we present standardised selection differentials for fish body size. Estimates are obtained from acoustic telemetry, where we continuously monitored fish (n = 60) within a semi-sheltered area using a network of 25 listening stations. To obtain additional information about harvested cod, all fish (body size: 30–66 cm) were also tagged with traditional T-bar tags with a printed reward of 500 NOK (60 E). We estimate that 75% of the fish died within the study area during 1 year. Fishing mortality was markedly higher than natural mortality. Together, recreational fishers and commercial fishers caught at least 50% of the tagged fish during 1 year. Standardised selection differentials showed that fisheries targeted larger fish (i.e. favoured the survival of smaller fish), while natural selection favoured the survival of larger fish. Albeit on a small scale, we provide empirical evidence that harvesting can have a dominant influence on the fitness landscape experienced by a marine fish such as the Atlantic cod. We suggest that no-take marine reserves may help to counter evolutionary impacts of harvesting in the ocean. We thank Jan Atle Knutsen for skilled surgical implantation of the acoustic transmitters and a number of people at the Flødevigen marine research station for help with the telemetry monitoring. Suggestions from three anonymous referees improved the quality of this article. 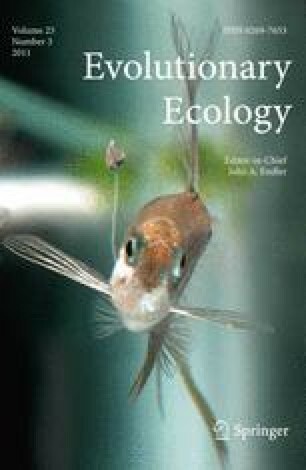 This study was presented at the International Conference on Evolutionary Ecology of Fishes Diversification, Adaptation and Speciation, November 2009, Erkner, Berlin. Our work was funded by the Norwegian Research Council through the Oceans and the Coastal Areas programme, project 178376.